As your jet flies over the Amazon basin, the forest is threaded here and there by sinuous ribbons, some black, others tan-colored. These are the rivers that are the forest's life-blood. They course through across the river plain bringing nutrient-rich silt to the starved soil. In some places they build up land, and in others they erode the river banks. 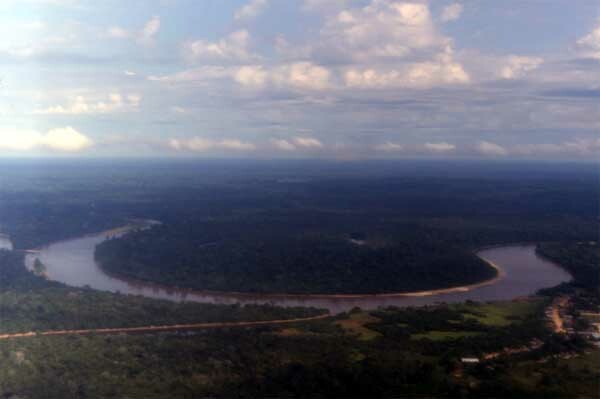 From the air, you can see the complex winding of the rivers that create habitat diversity for the rainforest plants and animals. This view of the Ucuyali River shows the complexity of lowland rivers. 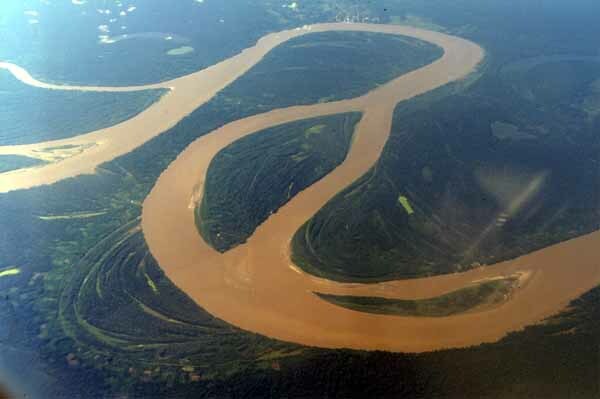 The sinuous curves and bends are characteristic of floodplain rivers. The "braiding" at the outer edge of the large bend (bottom left) marks earlier courses of the river that became filled with silt, causing the river course to shift. The heavy silt load is indicated by the muddy brown color of the water. A bit further downstream (right of picture) near Iquitos, this river joins the Marañon River to become the Amazon River main stream. As the plane loses altitude, the river's sinuous curves disappear into the distance. This view is near Iquitos, Peru and shows the Rio Nanay, one of the Amazon's thousands of tributaries. Note the road, and the street in the bottom left of the picture.